Four boats racing today, the last Wednesday evening sail of the season. Anton H launched his new Laser this evening. It clearly took a bit of getting used to, he missed the toe straps and fell out having just passed Bill J. Bill J made a kind comment as he sailed by. He then got blown over in the second race in a strong F2 gust (strange but true). Other than that it was a great day sailing. 05/09/18 was also the last wed evening sailing for 2018. Just Saturdays from here on in. See you all next for mid week sailing again next year. Series I was concluded tonight. Congratulations to James P H and Alan T in first, Ken and Davy L in second, Bill J and Joe McC in third place. George G once again sailing very well in his Solo. Anton H also went well today in the club Laser. No racing on the 11th Aug and we were becalmed on the 15/09/18. We waited on the slipway for the wind to come for about an hour. Eventually we gave up. By the time I got home to Prehen there was a fine breeze! The joy of sailing! So the final results for Series F are Ken and Davy L in first place, Bill J/Joe McC in second and James P H/Alan T in third. Well sailed! Racing in town today for the clipper event. A good sail into town in a steady F3. We passed a large group of swimmers as they left fro Gillilands slipway. They swam into the pontoons – sturdy stuff. Ken L and Davy L must have been inspired because they decided to go for a swim as well up near the old fuel depot in town. They quickly went off they idea and got back in the boat. We all gathered in town and the races were started from a rescue boat. The race course was up to a mark near the peace bridge, back down leaving the city centre nav mark to port and around the pin end mark on the start line X2. Good racing with large crowds on the quay. A spinnaker run the whole way back to Culmore. Many thanks to the Loughs Agency for organizing the event and to the rescue boats and OD for their time and efforts. Aidan O D going very well in his Laser. James P H and Alan T also sailing very well. Kevin L and Mark McC made a valiant effort to sail into town also but were beset by a series of technical issues with the boat and had to retire early. Aidan O D in his Laser sailing very well with two wins First over the line. it was windy and Joy and Jude capsized in race 1. They struggled a bit with the recovery but managed in end. Four boats racing all GP’s sailing on PY. Tonights race also brings Series E to a close. Congratulations to Ken and Davy and Peter L. Peter sailed with Ken taking Davy’s place from time to time. Aidan O D also did very well bringing up second place. The final podium position goes to Bill J and Joe McC. Two discards were allowed. Just two boats racing tonight: Ken and Davy L and Anton H and James McL with results in that order! Racing tonight with two lasers and two GP’s. Well done to Aidan O D who took a win in Race 8 and to James P H and Alan T who won race 7. The course went down the river to faughan and conniborrow. Bill and Joe with a nice win tonight. There was no second race as the wind dropped. NB: If the number on the results is shaded it means that the boat in question was not sailing that night. For example in Race 5 Aidan O D was not sailing and either was Joy W/Ruth. Welcome to Joy W and Ruth sailing in a Gp14 and going very well. Aidan O D also going well in his Laser. I did not see the race but was informed there was a good steady breeze. There were three DNF’s in race one. It was three laps long – that may have contributed to the last three boats declining to sail the last lap. Great to see Ciaran Moore out in the club laser and doing well. He will no doubt more greatly appreciate the comfort and spacious accommodation of a GP14 after a scoot in the Laser. Great also to see Caoimhe L back out sailing. Anton H was sailing the club Laser. George G was sailing his home built catamaran. He has been awarded a LFYC handicap of 1185 (same as Anton H Laser). George G did not finish the first race but was flying in the second race and passed Anton H on the finish line. Bill J was sailing with Owen McC. This was the last racing day of Series C with Ken and Davy L emerging as clear winners. No racing today due to weather conditions. I did not see these races but I can see that race 3 was long, perhaps two laps at 61 mins + but race 4 was only 24 mins +. Kevin T picked up a DSQ in race 4 because he hit the finish mark. Sorry about that Kevin, rules is rules! Racing today in bright sunny, windy weather. Perfect! Costa Derry! Start at the Perch, beat to Faughan, reach to Conniborrow, run back to Leonard’s mark. Lap one was very windy and no one fancied the spinnakers. Lap two the spinnakers were all out. Welcome to Aidan O D to sailing with LFYC. A long beat and a pretty dead run on the way back were hard work for Kevin T in the Laser. Anton H and Aidan O D going very well on the beat. Very windy. A tough sail up through the channel. Spinnakers all the way home. A great test of sailing excellence in Lough Foyle. The stretch through the narrows was a very dead run. Anton H and Joy W saw Ken and Davy L and fancied that if they could hold the course without a Jibe they might catch them. It was working and then suddenly there was some swimming. Recovery was without made without difficulty and completed when Joy W had carefully put her sunglasses in her pocket. Lol. Many thanks to Liam H and Big Pete who came up to provide rescue cover and to lay the mark. Greatly appreciated. Congratulations to James P H and Alan T who won the John Hume/University of Ulster trophy for 2018. Light winds and strong tides. Anton H racing in the club laser, strong tides forced an RTD. Congratulations to James P and Alan T who win the race today. Made a good start and stretched away for the whole race. Congratulations to Ken and Davy who win the overall series D 2018. One discard race was applied. No racing today – light winds. No racing today, I have forgotten why, I remember one evening was blown out and another was becalmed. Bill J sailing in the club Laser and going very well. A good breeze and a strong tide in the opposite direction cut up the sea and made for a bumpy evening of sailing. Anton H and Aidan O D went inside the hazard mark at the oyster bed and were DSQ in race 7. Nightmare! Series D got of to a great start with a nice bright day with good wind (F4 to start). Sailing from the Perch to Faughan, Conniborrow, Leonard’s mark X2. Strong incoming tides. A big factor was when you choose to cross the channel. Great to see Emerald H out with Bill J. George G going very well in the Solo in race 2. If all races scheduled are sailed then 2 discards will be applied. F3 Variable, sailing in Culmore bay. A bright evening. A bit of a tussle on the start line in race 3 with all boats choosing the same point to start on. George G sailing very well in the solo. Ken and Davy clear in the lead in both races. Anton H sailing the club Laser. Race delayed for a while by a big Tanker leaving the port. A nice evening for sailing, F3. Racing from the Perch, to Conniborrow, then the beat continued to Faughan, then a run back to Leonards. Strong incoming tide. Bill J was sailing in the Laser. Only had time for one race. Three boats sailing today, Anton H in the club laser. Sailing in Culmore bay in a good breeze F3-4. 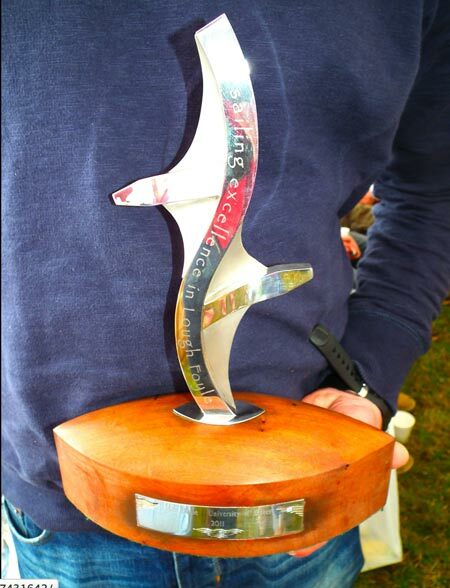 Today also is the final race in Series H. Congratulations to Ken and Davy L who retain the trophy from last year. Anton H and crew came second and Kevin T came third. From the OD notes I can see that here was some confusion on the line at both ends of the race in R5. Two boats did not go through the line at the start of teh race and one boat did not go through at the end. Aidan O D was sailing very well in his new laser with a win first across the line. In R6 the issues about the line were resolved and all boats successfully started. David T and Joy W were sailing very well and got the win. One boat DNF. All finishers crossed the line within 4 minutes. Kevin T and Ciaran and Eva M exchanged places in Races 3 + 4. Anton H and Aidan O D gave Ken and Davy a bit of chase in Race 2 but still no chance of getting out in front. Congratulations to Ken and Davy. The OD has written on the notes that the race started 25 mins late with two question marks added and was observed on the slipway muttering and generally being grumpy gently encouraging people to hurry on. Series H got of to a great start with a nice bright day with good wind. Sailing in Culmore bay. Congratulations to Kevin T who was going very well in his laser today. George G also going very well in the Solo. Great to see Kevin L out sailing with Anton H. Great also to see David T and Joy W back out on the water. A windy day F5, W. Start at the Perch, Mark in Culmore bay, harts, conniborrow, faughan X 2. Two capsizes. B + B Johnson went over with spinnaker up in the first race and Anton H was blown over on the beat in the second race. The lasers and the phantom had a very exciting time on the reach from Harts to conniborrow.